Tolerance to the Fetal Allograft. Part A: Is the Fetus an Allograft and is it Object of Immunological Tolerance? For an immunologist, pregnancy remains an enigma although an enormous accumulation of knowledge was achieved during the past decades. Why is the foetus not rejected? In this eBook are described the most recent findings that could possibly answer to this crucial question, as well as the consequences of such discoveries for some important pregnancy associated pathologies, such as preeclampsia and of course recurrent pregnancy loss. New molecular and cellular networks are now integrated in a rational way in order to propose satisfying models that explain how normal foetus develops and how it avoids an immune attack. However, we still do not have the whole story that leads the immune tolerance. Interestingly, when I started my research training late 70’s with my mentor Jean Dausset at Saint Louis Hospital in Paris, he was collecting sera from multiparous women for his studies on HLA polymorphism whereas I was trying to isolate T lymphocytes with suppressive activity. Concerning his work on polymorphism most is now done thanks to the molecular biology approaches. As for the one bearing on suppressor T cells, the concept was there but unfortunately neither the tools nor the knowledge, which allowed Sakaguchi and colleagues to describe for the first time in the mid 90’s the T regulatory cells (Tregs). Nevertheless, are these cells playing a tolerogenic role during pregnancy? More studies are needed to give a final answer to this question since Tregs exhibit distinct mechanisms to exert their function at the steady state and during inflammatory events. Similarly, what about NK lymphocytes which were initially described as cells exhibiting spontaneous killer activity without previous immunization and were initially proposed to have deleterious action for the foetus? Meanwhile, were described several activating and inhibitory receptors that control NK lymphocyte effector function as well as were identified two distinct functional subsets that have permitted to consider them as potentially benefic for normal pregnancy by secreting cytokines such as VEGF or Angiopoietin 2. For a “mainstream immunologist”, once we will have discovered the cellular and molecular basis of immune tolerance during pregnancy, which could be the end result of different mechanisms that are used over distinct period of time, then we might be close to manipulate the immune system for avoiding graft rejection and possibly conversely to stimulate immunity for malignancies eradication. Hence, this ebook brings me remembrances of my early years with my mentor in Saint Louis hospital while describing what has evolved since then and paving the way for the future…. 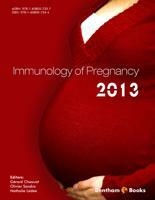 “Immunology of Pregnancy 2013” is a major achievement. Edited by Gérard Chaouat, a life long expert in the field, this eBook involves some 65 contributors, all renown in their respective specialties. The 14 chapters cover the field of reproductive immunology in a very comprehensive fashion. Immunology of pregnancy occupies a very special place in immunology. It has played a major role in setting some of the initial major concepts of immunology. Then, it has somehow become isolated. This may result from the specific status of human pregnancy as a major issued of high personal and social relevance. Reproduction defects in humans affect large numbers of women and men, and profoundly affect their lives, without being truly considered as “real” diseases. Rather, they were felt to be confined to private life. They had in addition to cope with the many cultural and religious traits that guide individual and social behaviour. This situation has undoubtedly impacted the Science in many indirect ways. For example, there have been many attempts to treat reproductive deficiencies in rather empirical ways that had little to do with basic Science, and were less stringently controlled than standard clinical trials. To some extent, immunology of pregnancy might be the only field of immunology in which research, for several decades, has been more focused on humans than on animals, especially mouse models. In other areas of immunology mouse, work has largely dominated over human immunology. The recognition of human immunology as a stand-alone area of immunology is a recent phenomenon. It was largely triggered by the emergence of new technologies that allow performing more extensive and profound even basic research on humans directly, without relying on the conclusions derived from mouse models. This shift of balance between research on mice and men is of major importance, because it is now clear that the mouse and human immune systems are significantly different, to the extent that mouse is too often non predictive of what happens in humans. The broad phenotypic diversity of human beings is an other incentive to promote human immunology. It may thus be possible that reproductive immunology was ahead of its time in working extensively on humans –perhaps too much in advance to conquer enough basic scientific knowledge. On top of this, the main stream of basic immunology has focused for quite some time –and rightly so – on a number of specific immune phenomena and mechanisms such as the generation of diversity (antibodies and TCRs), or more recently the Toll Like Receptors involvement in innate responses. On the contrary, immunology of pregnancy is by essence systemic, with much defined outputs, the prediction of which requires a holistic approach. We all know, however, that the latter requires an extensive understanding of the elements that constitute the system and of their interactions. More Science is obviously needed before a system biology approach of pregnancy can actually be productive. As a matter of fact, the phenomenon of pregnancy is even more complicated and comprehensive than an immune phenomenon such as an immune response. Pregnancy and the reproductive immunology associated with it, involve a broad variety of physiological issues of all kinds. It has to cope with development biology, the endocrine system metabolism, etc. and not only immunology per se. This point can be made for immunology at large. Immunologists too often forget that the immune system is embedded within the entire organism to the extent that it is hardly possible –and actually impossible– to define the borders of the immune system. Immunology of pregnancy thus recapitulates many of the issues that deal with immunology in the broad sense of this word. This eBook is not only comprehensive. It is also written in a somewhat unusual way, because it calls on history and reports a few anecdotes. This is associated with the unique character of the editor, Gérard Chaouat, as man who has invested his entire scientific life in the discipline. Together with a large number of scientific achievements, he has experienced all sorts of special situations, some of which are indeed worth being reported. On my side, I wish to share one anecdote. Twenty years ago or so, we collaborated and made a nice piece of work in a murine model of abortion. My co-workers had mutated all the aminoacid residues sitting on the surface of the alpha helices of the H-2 Kd molecule. We could thus analyse which MHC residues where involved in the immune reaction leading to abortion. This paper was accepted in a good immunology journal, but at the same time, Gérard was writing a general paper on pregnancy for a book dedicated to the general public. He received the galley proofs at the same time and mixed them up. His general paper was rejected by the immunology journal. Nevertheless the immunology paper was immediately sent to print and published in the book for the general public, because the editors did not notice the substitution. Once published, the paper could not be re-published as such, and this is how a good piece of Science has passed completely unnoticed. Immunology of pregnancy is a fascinating field. As a few other fields, such as that of vaccination, it is directly rooted into the life of people. This gives a special taste to the science and endows it with a human dimension that imprints the field very significantly –some times, I must say to the expense of scientific rigour in developing human applications, but other times by providing completely new approaches. This eBook is a lively illustration of this combination of high-level advanced science with the more pragmatic questions coming from the people. The eBook includes a huge amount of scientific knowledge and perfectly reflects the past and current state of this particularly complex, essential and fascinating field. It is highly recommendable. Reproductive Immunology is (too) often seen as dealing only with the paradox of the survival in a theoretically hostile maternal immune environment of the “foetal allograft “in mammals. Thus, most authors date its start from 1953 Medawar’s now citation classic. However, as will be discussed in this eBook, the “danger” theory enunciated by Polly Matzinger states that there is no problem in such an intimate but peculiar, since necessary, tissular relationship. That immunity might threaten Reproduction is for her an evolutionary nonsense. In fact, Matzinger’s interest in Immunology was at least partly triggered by discussions she had about the “paradox” of placental pregnancy long before she even thought she will one day run the famous “ghost lab” at NIH. We will, of course, indeed discuss her theory in one chapter of this eBook. But anyway, it is an error to believe the topic is limited to the relationship between the mother and the foetus: the field is dealing with gametes, since they are necessary to Reproduction, and since pregnancy starts with Fecundation. In fact, so did Reproductive Immunology when it started in 1899 as, independently, Landsteiner and Metchnikoff obtained hetero antibodies against sperm. One year afterwards, Metalnikoff obtained the 1st (immobilizing) iso antibodies to spermatozoa by injecting guinea pigs with their own sperm. This, incidentally, and it is too often forgotten by mainstream Immunologists, was one of the first demonstrations of “horror autotoxicus”, as Erlich would later (re) name autoimmunity. Much later, the first steps forwards in Reproductive Immunology were these of Voisin, Barber and Delaunay on one hand in 1951, Freund, Lipton, and Thompson in 1953. These were followed by Medawar’s lecture, and the seminal experiments of Billingham, with Beer, and later on Head. It is interesting and noteworthy to recall that when I joined, initially for what would become my Md. Thesis and my first real Scientific paper the INSERM U23 lab, under Guy Voisin’s direction, I was placed in the same room as Marta d’Almeida, Françoise Chadenier and Francine Toullet, who while working on anti sperm immunity taught me the initial steps in Immunology. In Francine’s lab, the top techniques at the time were sperm cytotoxicity and sperm agglutination for assessment of humoral immunity, as well as DTH measurements by Evans blue rat skin permeation and DTH caliper measurements of footpad swelling. The discovery of T and B cells cooperation, Gershon’s description of Ts (now rejuvenated as T regs) hit the field, as well as NK cells, albeit I must admit that when Herbermann described initially Natural killing, a 5% max killing of Yac-1 target cells in a 51 Cr CRT was judged by many as an artefact. Of course, at that time the mains controversies were centring on the eventual existence of paternal MHC antigens at the interface, whereas it was also the age of the first lectures in Saint Antoine and Pasteur of GP Talwar about the future of contraceptive vaccines (anti hCG). 40 years afterwards, we are no longer dealing with “lymphocytes” and antibodies, but with a variety of cell populations, which we can isolate, thanks not to their morphology, but to a variety of cell surface or cytoplasm markers. Cell to cell communication is effected by a variety of well defined soluble molecules (while many of the “factors” which were described in the dawn of cellular immunology such as Ag-specific TsF, including “TsF1” and “TsF2”, genetically restricted macrophage helper factor, etc… have joined the infamous I-J region in oblivion). When Tom Wegmann wrote –and it was a conceptual revolution- that the embryo is bathed in a sea of cytokines, he was referring to at best 10 of them, and Tim Mossman had just delineated Th1 from Th2 cells/cytokines. Now we have more than 35 interleukins, several super families, toll receptors. We know that contraceptive vaccines are feasible (including, one forgets it often, in animal species, where one, for example, has helped to control fox mediated rabies propagation). In fact, Immunology is too often neglected by many obstetricians, who seem to forget (ignore?) Nature’s Editorial “would there be life without LIF”, pinpointing by then that immune molecules can be necessary for pregnancy. Another reassessment was the realization of the role of NK cells, “killers become builders”…. Thus, the field is now established by its own. Parallel developments in ART have emphasized, I repeat, that Immunology could be as important as Endocrinology, whereas more and more facts are implying Immunology in such syndromes as pre eclampsia. But it is a rapidly moving field, so, albeit the last (and excellent it is) treatise dates from only 2006, the need for another update emerged. The eBook format is excellent in that respect, allowing relatively rapid publication and possibly regular rapid updates. In keeping with the rapid evolution of the discipline, I preferred not to be preposterous, and thus to name it “Immunology of Pregnancy 2013” rather than another “Immunology of Pregnancy”. Now, who should read this eBook? Mainstream Immunologists, whose presence on this planet has been dependent on Immunological intervention, a fact they are for most of them surprisingly unaware: but they should also discover a very fascinating New World, and I recall the surprise of a major actor in the cytokine field, who actually discovered the first Interleukin (IL-1), after a lecture I gave at the FIMSA (Federation of meeting, in Hang Zhou, China “I never thought there were so many important cytokines in the uterus!”. But this eBook is also aimed at Gyn/Obs clinicians…. I know that Immunology has its Jargon, but this is as inescapable as “strangeness” in Nuclear physics and cosmology. Without suggesting the clinicians to make a similar effort as the one required for a Beotian to enter quantum mechanics, we really believe that comprehension of Immune events of pregnancy is now a must for them, and will lead them to new diagnosis and therapeutic tools/ behaviour. Finally, this eBook is of course aimed at the old and, more important the young Scientists in the field. We have tried to encompass most of the important topics (with the exception of Allergy and the foetus and neonate, a topic which deserves a specialized treaty, per se, and stress, since Neuro Immunology is a field by itself, albeit we allude to it in several sections). Megève, French Alps, August 1st 2011. Paris 1st May 2012. The views expressed in the chapters are my own, and do not commit any of the other contributors. The chapters in this eBook are made so that, albeit they complete each other, each one can be read independently. Thus, “redites” are unavoidable, and in fact necessary, as are left contradictive opinions when a matter remains controversial. The eBook planned originally a chapter on Immunity and Infection /parasites during pregnancy. Because of health problems and then death of the principal author for this chapter, this plan had to be abandoned (see last pages). But we hope, thanks to the eBook format, to be able to provide later on this chapter in electronic form.